That’s right. The Mexican Libertad does not have a nominal value stamped on it, only the weight. Instead, these legal-tender coins have a floating value that is quoted on a daily basis by the Banco de Mexico and is based on the coin’s silver spot market value. Celebrating the 36th year of the Silver Libertad 2017 marks the 36th annual release the Libertad. These silver coins have been produced since 1982 by the Casa de Moneda de Mexico, which was established in 1535 and is the oldest mint in North America. 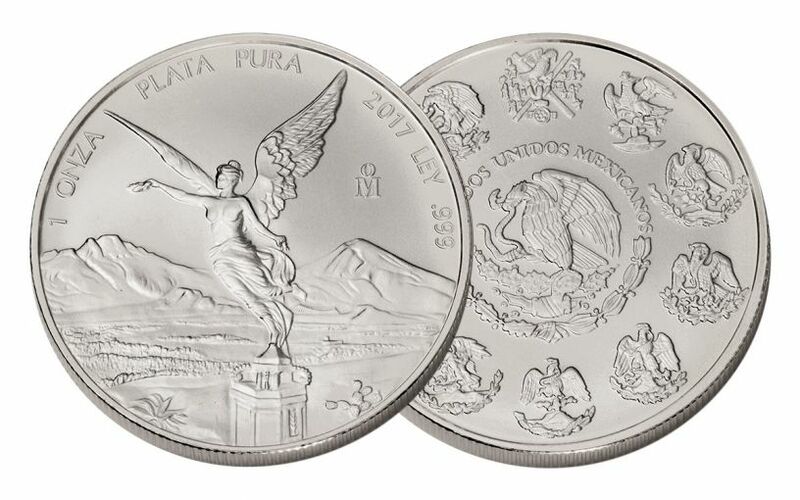 Struck in one ounce of .999-pure silver, the Mexican Silver Libertad is guaranteed by Banco de México. On the reverse side the Libertad features a depiction of the winged goddess Victoria as portrayed on the Angel of Independence monument before a backdrop of the Popocatépetl and Iztaccihuatl volcanoes. The volcanoes memorialize the legend of two Aztec lovers for whom they were named. As one of the most recognizable landmarks in Mexico City, the Angel of Independence has become a focal point for both celebration or protest. Located in downtown Mexico City, this 24-karat gold-leafed bronze statue weighs seven tons and stands on a column 115 feet above the street. The Winged Victory statue shows the soaring Angel of Independence carrying a laurel crown in her right-hand symbolizing victory and a broken chain in her left, signifying freedom. The Mint Mark of the Mexican Mint is inscribed to the left of the Winged Angel through the symbol of the "M" under an "O." 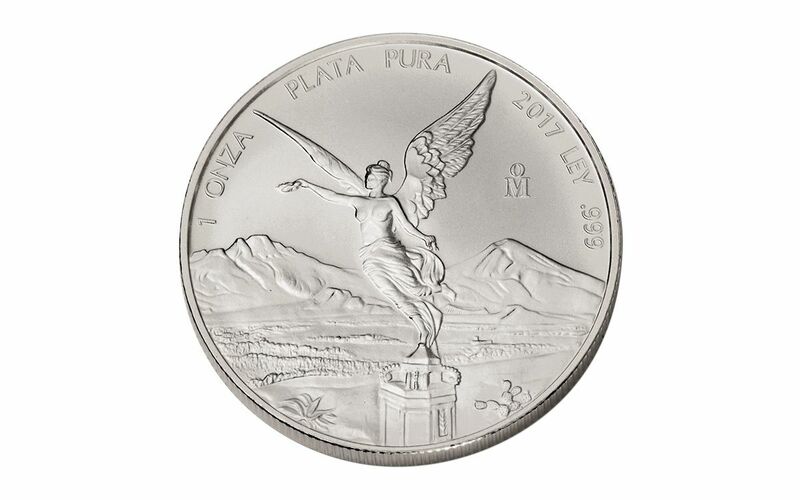 Each Silver Libertad is struck in 31.1 grams of .999-pure silver and has a diameter of 40mm. The obverse design features Mexico’s National Coat of Arms, which depicts a Mexican eagle standing on a cactus with a snake struggling in its beak. The coat of arms is contained within a circular design element, with the bottom half of the circular border composed of a wreath and the top half indicated by the legend ESTADOS UNIDOS MEXICANOS, which in English translates as Mexican United States. Surrounding this central obverse feature are 10 smaller versions of the national seal, all featuring the Mexican eagle in various symbolic poses. 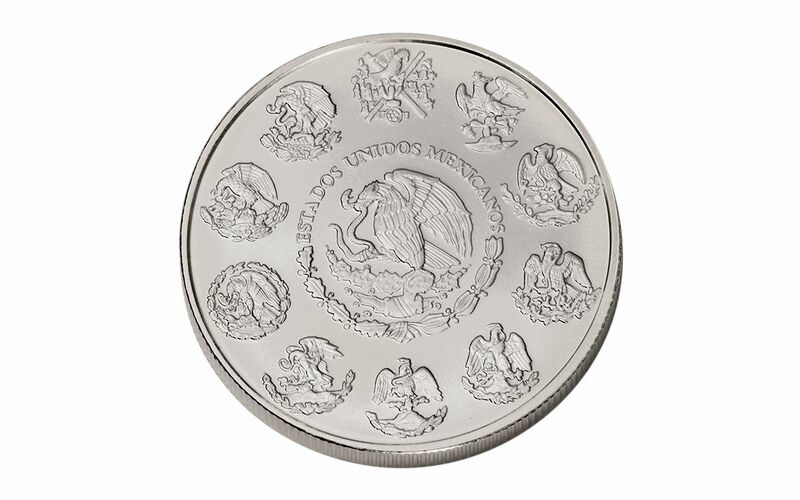 This magnificent 1-oz Silver coin is a popular choice not only because of its attractive design, but also its traditionally low mintage at Casa de Moneda de México. Add this 2017 1-oz. Silver Mexican Libertad coin to your cart today!